The waste and mismanagement under Jihadi Jeh Johnson at DHS is criminal, a fitting characterization for the practices of a department run by the biggest scofflaw, anti-American operative in government, aside from Hussein Obama. Johnson is always quick to claim he can’t do his job of border enforcement because his budget shortfalls require discretion. It’s his waste, apparently deliberate, which create those shortfalls, a mechanism for him to fabricate a situation in which he “has no choice” but to ignore the law and allow illegal aliens to roam freely within the United States. The amount of waste is mind-numbing. According to an article in the Daily Mail, we taxpayers are on the hook to the tune of $300,000 every day for the costs of deporting illegal aliens on both commercial flights and private jets. ICE spent $116 million in 2015 alone in transporting 235,413 individuals back to their home countries, an average of $492 per person. Whatever happened to going Greyhound and leaving the driving to them? Nothing but the best is good enough for our illegals? Load em up, point the bus south, drop off the Mexicans at the border and continue on south to Central America. If the Mexicans don’t like it or don’t want to cooperate, start charging them a bounty for every one of their citizens we capture and have to repatriate as well as those of other nations that pass through Mexico en route to America. They’ll soon cease to be a problem one way or another. But the bulk of the expense is not the travel costs. Simply housing and supporting the illegals are much more and that doesn’t include the costs that the states absorb. The figures that are available under Johnson, Obama and Congress’ “Let the illegals in and screw the American people program” are staggering. ICE quoted a number of $12,213 per illegal per year. 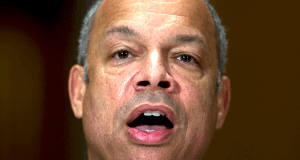 Rather than simply deny the illegal border crasher access to the United States, Secretary Johnson and Hussein Obama have decided unilaterally that they will redefine the word “refugee” and grant every illegal a hearing at some far off date that most don’t bother to show up for. That makes the American people, under their perverse liberal logic, responsible for supporting the border crashers until their hearing date. That’s insane. Some of the most egregious examples of reckless waste involve air travel for those being deported. In addition to the cost of flying commercial, some illegals are given private luxury jet flights back to their homelands, including on Gulfstream IVs. They even went so far as to charter a twin engine jet that is capable of carrying 261 persons to transport one single individual from the US to Nigeria. Wouldn’t a military transport that was heading that direction anyway have been a more logical choice? The Daily Mail notes that such “high-risk charters” have happened on at least 34 instances, claiming it to be necessary because of the number of security personnel required. If the money was coming out of Johnson’s personal bank account instead of the “limitless” US Treasury, Johnson would have long ago been on the phone with his old buddies back at the Pentagon, where he used to work, making arrangements to stretch those travel dollars. The president of the Taxpayers Protection Alliance, David Williams agrees, saying, “This is insane. This is an outrageous and unacceptable waste of tax dollars. There is absolutely zero justification for spending this amount of money deporting immigrants.” They’re not immigrants, they’re illegal invaders, David, but you’re right, it’s an outrage. Another infuriating revelation is that the government pays $231 every 24 hours for every detainee housed in the system. With 2, 105 declared to be presently within the system at the South Texas Family Residential Center in Dilley, TX, the daily cost at that one facility alone that the American people are paying, strictly as a result of Jeh Johnson deciding everyone that sneaks into our country can be considered a refugee is a staggering $486, 255 per day, almost half a million dollars per day just at that one facility. ICE operates a large network of such facilities, according to the report, so the figure is quite large and totally unjustified. The cost of repatriating border crossers at the border is a onetime shot. This expense that Johnson and Obama have us shackled to through their detention centers is a never-ending budget buster designed to provide a negative associated with enforcement. But it’s not enforcement that is the problem. It’s a slow motion capitulation to the open borders agitators and a mockery of true enforcement. It is not designed to succeed. It is intended to burden the system to the point of failure or to total collapse. That is the mission Jeh Johnson was put in place to accomplish. That is the job he’s doing on the American people. I’m Rick Wells – a constitutional conservative writer who recognizes that our nation, our Constitution and our traditions are under a full scale assault from multiple threats. I’m not PC; I call it like I see it. – “Like” him on Facebook, “Follow” him on Twitter. – Please SUBSCRIBE in the right sidebar at http://RickWells.us or http://constitutionrising.com to receive our posts directly. Thank You – Rick Wells.